Grilled Cheesesteak is a go to for me when I’m looking for something satisfying thats going to fill me up. 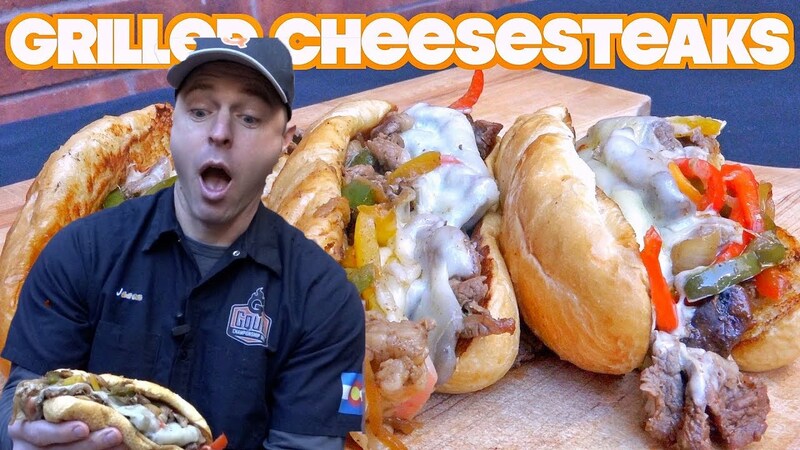 Thinly sliced Ribeyes with onions, peppers and mushrooms with some sliced provolone and Pepper jack make these Grilled Cheesesteaks over the top delicious. We grilled them using the Ballistic Griddle on a Weber Kettle. Place the steaks in the freezer 45 minutes prior to cooking. Place a coal holder on one side of your grill, or just pile them all into one area. Put the Ballistic Griddle half way on top, making sure to keep one side cool. Aim for a medium heat for this cook so that the griddle does not warp. While the griddle is heating up, cut up your peppers and onion into nice, thin slices. Add some oil, the onions, and mushrooms to the griddle and season with The Rub. Mix them up well and cook until they soften and begin to brown. Push the onion and mushrooms to the cool side of the griddle. Add some more oil and the peppers to the hot side. Season with The Rub, stir, and cook until they soften and take on a similar color to the onions. Move to the cool side. Remove the steaks from the freezer and trim off any large deposits of fat. Standing the steaks on their sides, carefully cut them into thin slices. Add more oil to the griddle, add the sliced steak, and season with salt and pepper. As it begins to cook and soften, you can break the slices apart into smaller, bite-sized pieces. Because the steak is cut so thin, it will not take long to cook. Keep an eye out for it to change from a pink to light brown color. Mix the steak and vegetables together, separate into four long piles and add sliced cheese to the tops of each pile. While the cheese melts, butter both sides of the sub rolls and add them to the grill to toast. Add a small amount of water to the griddle to create steam, then cover the entire griddle with a large bowl or foil. Once melted, use a spatula to grab an entire pile and carefully lift it into one of the buns. Sink your teeth in and enjoy! Words just don’t do it justice, check out the video below to see how amazing they look!